You all KNOW I love food and so does my little bundle of furry love Buffy. She is quite the beggar and will eat pretty much ANYTHING! When I first adopted her, I had to do some research to make sure I didn't give her anything that would make her sick. To start the new year off right for all your furry friends, I'm sharing a list of things to never feed them. 1. Chocolate - this is one most people know about. Also coffee and caffeine in general are bad for our pooches. Dark chocolate is the worst but even white chocolate is bad. 2. Grapes/raisins - this is another one most people know about. Remember to remove the raisins from any treats that are shared. 3. Onions - another no brainer. But don't forget chives and garlic too. If there's a tiny amount in something like spaghetti sauce you don't have to worry as long as it's not a regular treat. 4. Raw yeast dough - the rising action causes problems so always make sure dough is cooked. 5. Nuts - I've heard that nuts are bad for our pets but specifically macadamia nuts and walnuts pose a serious threat. If you can't remember what kind of nuts are bad when feeding your pet, just avoid them all and you won't have to worry. 6. Avocado - this was a big shocker for me. I had no idea this was a problem. The pits and skin are especially dangerous. No guacamole! 7. Ice cream - it's the milk that can cause problems - and candy, especially anything sugar-free that contains Xylitol. 8. Bones, raw meat, fish and eggs, fat, skin - some people swear by a raw diet for their pets. Others feed scraps and trimmings. These items can cause serious problems like choking and bacteria - and aren't worth the risk. Don't feed a raw diet unless you have thoroughly researched them and discussed it with your vet. 9. Tomato and potato plants, raw potatoes, seeds and pits of fruits and rhubarb. 10. Alcohol - sorry people, it is NOT funny to get your pet drunk! Our pets have the same effects that we do when drinking but all are amplified and can result in death. Save the booze for you and your people friends instead. For more details, visit the ASPCA site. You can also view a slideshow from WebMD. And what should you do if your pet accidentally ingests these items? Call the Animal Poison Control Center at (888) 426-4435, your vet or your local emergency clinic. May 2012 bring you health, happiness and love. Life is short - take time to enjoy it! The Cleveland International Film Fest is a Must Do for me every year. Join me and other independent film buffs in March or you can still get your hands on tickets for a few of the Film Feasts. You have until Weds. at 5pm to ensure holiday delivery. Perfect for the foodie on your list or someone who doesn't like to cook. It's 52 deals at local restaurants for $29.95 + shipping. *Loretta Paganini, Viking at Legacy Village, and Western Reserve in Hudson are classics. *Two options for cooking classes at home are Chef Kimberly McCune Gibson of Hungry Bee Catering and Chef Jason of Molinari's - both will come to your kitchen and cook up at a feast to remember. *The Chubby Cook is a newcomer that looks to be a great addition to the mix. Use coupon code HOLIDAYS2011 thru 12/25 and save 10%. Or if you prefer, use the code ALF2012, 40% of the cost of the class will be donated to Hungry In Cleveland's American Liver Foundation fundraising efforts. * The Tri-C Hospitality Management Center is another new place to attend a class. Taught by Chef Brandt Evans of Pura Vida. The facilities are amazing and I'm sure the food will be too. *For the vegan on your list Foodgazi is the place to go. *Another great Lakewood destination is Gatherings Kitchen. 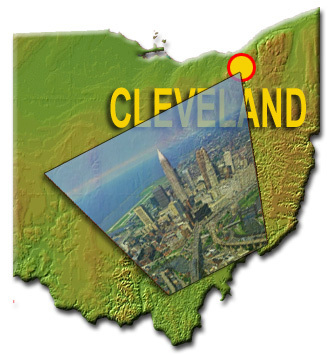 Check out I Heart Cleveland's blog about it here and you can enter to win tickets too. If you stop by Weds. 12/21 they are offering free sticky buns and coffee to sweeten the deal. *For a weekend destination, you can visit Gervasi Vineyard in North Canton. They have a winery, restaurant and villas to compliment your cooking class and make it into a weekend getaway. Whatever the sport your favorite fan cheers for, Cleveland has a team for you. Browns, Cavs, Indians and the Monsters are the big boys. Maybe Roller Derby is more your style? Don't forget about the minor league and college teams too. 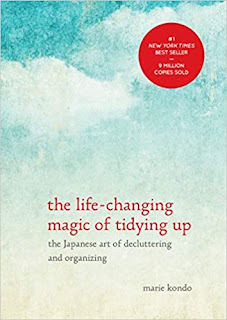 For more ideas, click here. Put the tickets in a box with a t-shirt or other gear. 5. For the coffee lover, get a gift card from your favorite local coffee shop (Phoenix, Erie Island, Civilization and Gypsy Beans & Bakery are some of my favorites.) 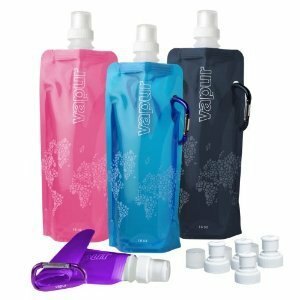 add it to a basket with a double walled travel mug, some sweet treats and some whole beans and you have something that will be appreciated for a long time. 6. 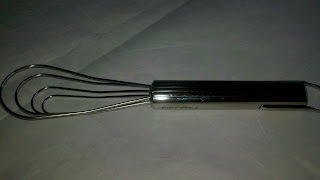 NEO Food Tours has lots of tours and events to choose from in 2012. I've attended several of their signature walking tours and have enjoyed them all! If you missed my blogs about my adventures with the NEO folks you can read them here - Public Square, Gordon Square and Tremont. 9. If you know where they get their hair and nails done, a gift certificate to their favorite place is always appreciated. I like to wrap it up with either some funky new nail polish or fancy hair supplies so they have an actual gift to open. 10. Holidays are stressful and a great gift to help your loved one unwind is a spa gift certificate. Spa West rocks and they even have a special where you can get a 20% bonus card when you purchase a gift certificate of at least $100. Mario's has multiple locations in the area. Dino Palmieri at La Place, Zen in Ohio City, and Charles Scott are other good choices. Groupon is offering a deal today to Europa Spa in Beachwood. 11. I'm a wine lover and always appreciate a good bottle as a gift. Match it up with an aerator or other useful wine accessory. My friend recently got me something like this drip catcher pictured and I love it! Miss WineOH has some good suggestions on her site and will also be hosting her famous Wine and Cupcake events in the New Year - contact her directly for details and tickets. 12. Touch screen gloves seem to be on everybody's wish list thanks to our obsession with our smart phones, iPods, and tablets and our frigid NE Ohio winters. 13. How about a pass to one of our fabulous local attractions? The Greater Cleveland Aquarium is opening next year and the people on your list would likely love to check it out. You can give a gift membership to the Cleveland Museum of Art by clicking here. The Cleveland Natural History Museum is always fun. You get purchase a membership here. Great Lakes Science Center is another cool place, especially for the kiddos. 14. For the chocoholic - Lilly Handmade Chocolate in Tremont is a must! Her candies are bite sized works of art and delicious! For the holidays, she is even whipping up rum balls. 15. Indians Snow Days run until January 16th - snowtubing and ice skating in the middle of Progressive Field is fun for all ages. 16. If you have a new driver on your gift list, get them road ready with a gas card, local map or GPS and a car safety kit. 17. Act quick for a Groupon deal that is sure to please - a wine class for two from American Wine School being held at Lago in Tremont. 18. For the Cleveland ladies on your list, shop at La Femme de Cleveland. Use coupon code CLEVELANDLOVE and get 15% off your order. There's a giveaway that ends on Tuesday too. 19. And for those who like to make something tasty, check out Food 52's edible gifts. 20. 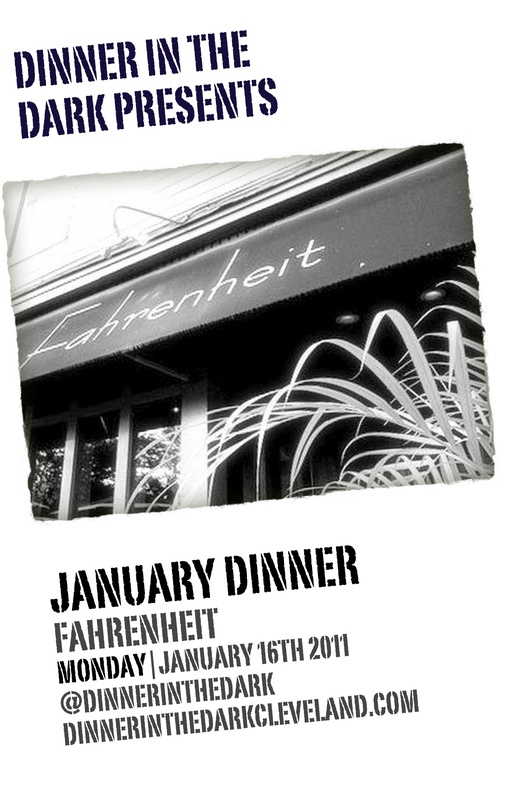 The Greenhouse Tavern is offering up a free bottle of wine with $100 in gift certificates. Who wouldn't LOVE THAT! And here's one gift you should NOT be giving - a pet! Too often pets are bought as gifts without considering the long term commitment that they include. Our shelters are filled with young dogs and cats that were discarded when the owners grew tired of all the work, time and expense they involve. Plus, the busy holidays are the worst time to get to know a new pet. The crappy weather doesn't help either if it's a new puppy that needs to be taken outside. If you really want to add a pet to the family, consider purchasing some accessories like bowls, leashes, toys etc to wrap for under the tree and then visit your local shelter after the holidays. Hope this helps you get all your shopping done and enjoy the holidays! When you go out to eat, there are so many choices! What part of town? What type of cuisine? Fancy or cheap eats? Feast or small bites? I love to share my favorite restaurants and places to score great food! I'd like to help you by sharing my rules for dining - eat local and eat smart. Eating local is the easy one. Even when I'm travelling, I always chose a local gem. There are so many non-chain restaurants to choose from! If you need inspiration locally or just want to be reminded of some great places, head over to Cleveland Independents. In addition to giving you dining ideas, they give you deals - sign up for their emails and you'll be notified of their discounted gift certificate sales. They also have a great gift idea for anybody on your shopping list - The Deck. It's a deck of cards and each card offers savings at a member restaurant. Perfect stocking stuffer! The second is a little tougher. The money you spend and the choices you make can impact not only your local community, but the world as a whole. That's pretty big stuff, right? When going out to eat, nothing upsets me more than seeing an endangered fish on the menu. I remember back when I was a much younger lady, I tried Chilean sea bass and thought I died and went to heaven! It was so delicious! I wanted to eat it every day. I guess everyone else in the world thought the same thing because now they are so overfished that they are endangered. I will never eat one again. Yes, I will miss the taste, but I can't eat something I know is likely to be extinct. Would you eat a snow leopard? Bluefin tuna and Chilean sea bass are poised to be the European tigers of our day. With a single bluefin tuna commanding up to nearly a half-million dollars on the Japanese market, and a boatload of Chilean sea bass fetching the same, there’s an irresistible economic incentive for pirates, poachers and plunderers to hunt out these rare fish. Sure, eating them is still legal — and there are even “certified catches” meant to encourage good fisherpeople who follow the rules. But when it comes to bluefin tuna, those “good catches” come from best-case-scenario, super-optimistic, fact-blind “science” as interpreted by people who fish for tuna. And when it comes to Chilean sea bass, that “good catch” accounts for a tiny fraction of the actual volume of fish that’s for sale. So if you think you got one of the very few “ethically harvested” ones, you’re probably kidding yourself, and even if you’re not, your dollars are playing an active role in the lucrative market that’s inspiring the pirates to head out on their boats. As a society, we should look at people eating bluefin tuna and Chilean sea bass the same way we’d regard someone sitting down to a roast bald eagle. When I see a restaurant offering endangered fish on their menu, I lose my appetite. I certainly won't order those items and I won't patronize the offending restaurant either. I make a point to voice my concerns with the management as well. There are too many fantastic and responsible places to go - I want to support the good guys with my dining dollars. So when you are presented with the menu, make a choice that will be good for you and for the good of our planet too. You may be thinking, "How do I know if a fish shouldn't be eaten?" A great resource is Blue Ocean's Seafood List. Not only does it tell you what you shouldn't eat, but it helps you pick a substitute. For our Chilean sea bass example, it suggests Alaskan sablefish. Realistically you can't always avoid shopping at or dining at places that sell the endangered fish. You can however make your thoughts known to the owners, shop and eat wisely and put your money where your mouth is. Monday I published my Great Food Blogger Cookie Swap recipe for Rudolph Noses . Today I'm sharing another favorite recipe with you. 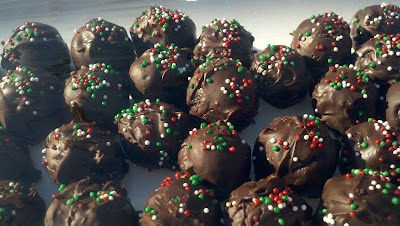 This one is a cross between a candy and a cookie - the easiest truffle you will ever make! 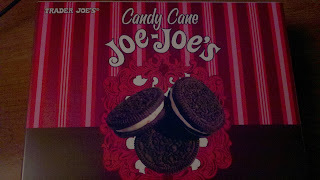 My recipe original recipe uses Oreos but when I found Candy Cane Joe-Joe's at Trader Joe's - I knew that they would make the recipe even better! But you could also use two forks or a small spoon. The idea is to completely cover the cookie ball while allowing the excess chocolate to drip off. That's it! I promise that when you make these, people will be super impressed and gobble them up. It's up to you whether you share your secret super easy recipe with them. 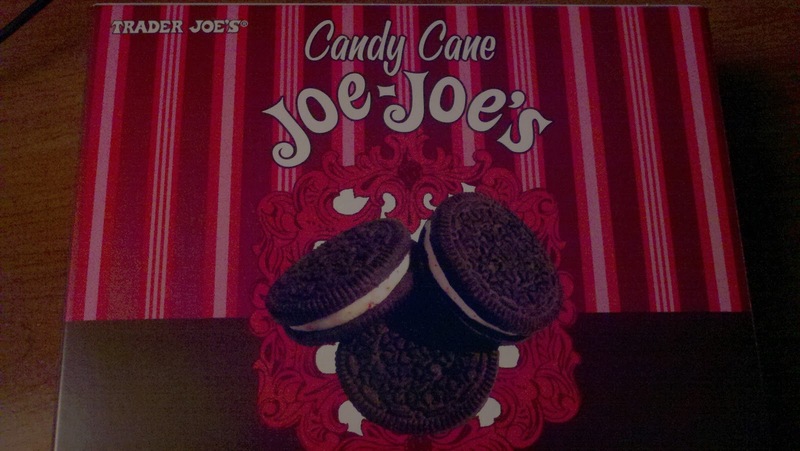 Wordless Wednesday - Ho Ho Ho! Over 22,000 cookies were shipped by 624 bloggers in the US, Canada, Australia, the UK, Agentina and the Czech Republic - that's a lotta cookies! It was a little intimidating at first because I am not a typical food blogger. But I do bake a ton of cookies for the holidays so I was up for the challange. After I made the decision to join, I had to figure out what cookies to bake! I originally wanted to make my Grammie's pizzelles but was worried about shipping them (would they break?) and also was concerned about people liking anise. So I decided on another favorite that I make every year: Rudolph Noses. They are based on an old recipe that I found on a corn flakes box. I couldn't find my usual recipe when I went to make them for the cookie swap so I looked online. (I included a link to that recipe at the end of this post if you want to check it out too.) 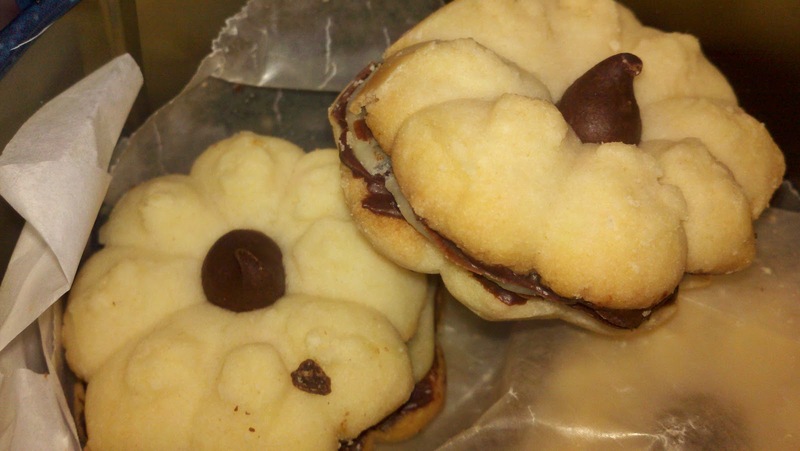 In my frantic search through my recipes, I found another version of the cookie from a Plain Dealer Sunday Magazine article from July 10, 2005. It is called Dorothy Buckner's Cherry Winks. My tweaked version is a family favorite - they are delicious and are a festive addition to the cookie plate. 1. In mixing bowl, sift together flours, baking powder and salt. Set aside. 2. In large electric mixer bowl, beat margarine and sugar until light and fluffy. Add eggs. Beat well. Stir in milk and vanilla. Add flour mixture. Mix well. Stir in dates and the finely chopped cherries. The dough will be very sticky. 3. Shape dough into one inch size balls. Roll in almond meal. Place on baking sheets coated with cooking spray. 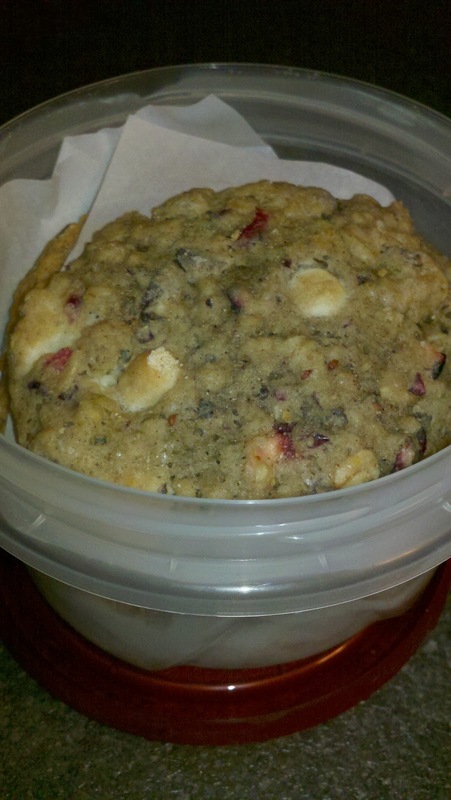 Top each cookie with cherry quarter. Flatten slightly with the floured bottom of a heavy glass. 4. Bake at 350° F 10 minutes or until lightly browned. Cool for 2 minutes, then transfer to wire racks. You can drizzle the cookies with white chocolate if desired once cooled completely. Now that they were baked, I had to decide how to ship the cookies. Not only did I want them to be festively wrapped, I was worried about the cookies staying fresh, so I packed them in seasonal zipper storage bags before placing them in the boxes. Because I knew my cookie swap matches were all out of state, I decided to pack an extra little treat - an Ohio shaped piece of chocolate from a wonderful chocolate shop in Granville, OH called Goumas. To keep the boxes closed, I used an elastic cord decorated with a Christmas themed trinket. Once they were shipped, my fingers were crossed that they wouldn't turn into crumbs during their journey west. I was so happy when I found out that my cookies arrived fresh and intact! And I was also extremely excited when I started receiving my cookies in the mail! A very cute tin arrived from Christina at 2 Hour Party cracked and dented but thankfully the cookies survived and were delicious! 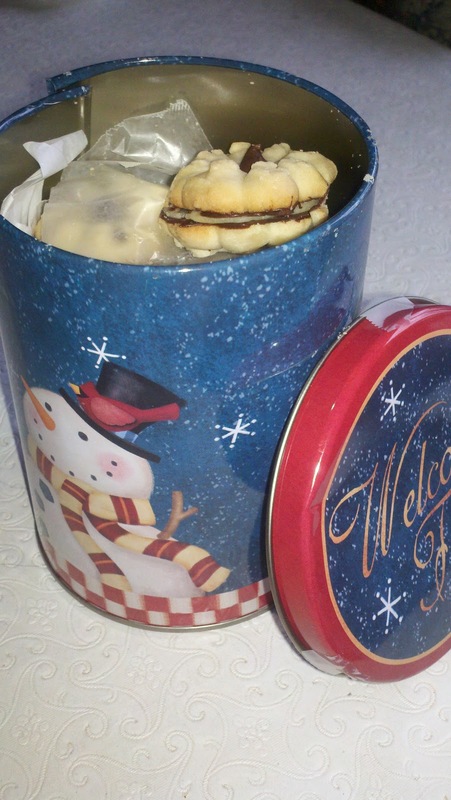 Her shortbread sandwich cookies were the prettiest cookies of the group and fabulous! I received ginger cookies from Lauren at Jammin in the Kitchen - they were spicy and chewy - yum! 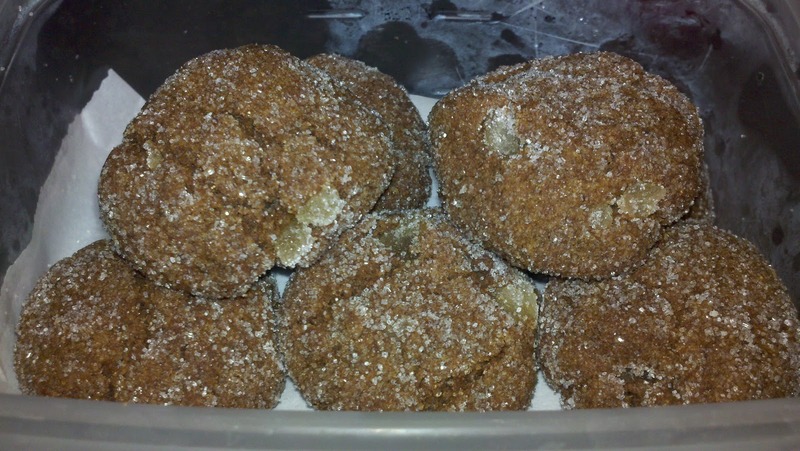 Ginger and molasses cookies are always some of my favorites so I was really happy to receive these. My last arrival was from Jamie at Kanga and Roux. Her oatmeal choco cran cookies were very tasty but there were only FOUR instead of the expected twelve. They were a larger cookie but not SO big that 4=12. Too bad because they were yummy and I love oatmeal cookies. Thank you so much to my swap buddies! I loved all my cookies and can't wait to read your blogs. I hope you had as much fun as I did! And of course, a HUGE thank you to our organizers: Lindsay of Love and Olive Oil and Julie of The Little Kitchen- you both did a great job! I really appreciate all the work you did to ensure that the cookie swap was a huge success! What a fun way to kick off the holiday season! It felt like Christmas every time I got a tasty package in the mail. I really enjoyed interacting with other bloggers from around the world. There's a Facebook page that you can visit to see what participants are saying about the swap. On Thursday December 15th, Love and Olive Oil and The Little Kitchen will be posting a list of all the participating blogs. You will definitely want to check this out because you'll be able to get the recipes for ALL the cookies! And if you think the cookie swap sounds fun and want to participate next year, you can sign up to be notified by clicking this link. They will put you on the mailing list so you'll be sure to find out in time to sign up. I know I'll be swapping again next year!